It’s Earth Day, Hope You Do Something Green to Celebrate! It’s Earth Day! Hope You Do Something Green to Celebrate- I am going for a walk in the forest. Forests cover one third of the earth’s land and absorb massive amounts of carbon dioxide making them a major instrument in mitigating climate change. They absorb airborne impurities and give off oxygen allowing us to breathe clean air. Forests protect our watersheds and provide us with clean water. They are home to the majority of the world’s terrestrial species, and many people around the world—1.6 billion according to the World Wildlife Fund—depend on forests for their livelihoods. The wise use of the world’s forests is critical to our survival and a healthy environment. Forests are vital in maintaining life as we know it. We are often led to believe that using paper is bad for the environment and that forest practices always lead to eroded lands and fewer trees—not so in North America! Wood from well-managed forests is a sustainable resource that is renewable, recyclable and can be planted, grown, harvested and replanted. Most paper is made using wood by-products (chips) from the lumber industry and recycled paper rather than whole trees which are typically used for lumber production. 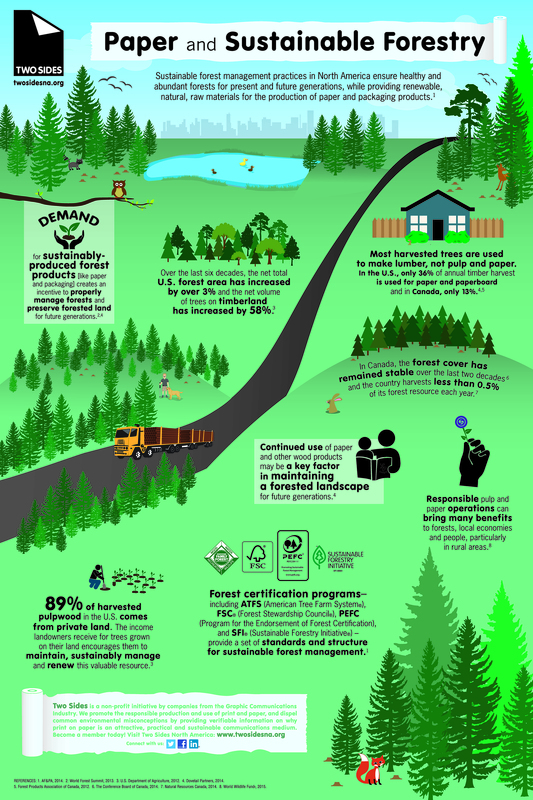 Forests in the U.S and Canada grow significantly more wood than is harvested each year. After my I walk in the forest, I am going to plant my American Plum tree that I got at a community Earth Day celebration last weekend. I hope you do something green to celebrate Earth Day too! Williams & Heintz Map Corp. is now a member of Two Sides U.S., a 501(c)6 non-profit organization that promotes the responsible production, use and unique sustainable features of print and paper. People depend on paper maps for many purposes, not the least of which is to get them where they need to go. We want everyone to understand the renewable, recyclable nature of print on paper and have the confidence that a printed map is not only very useful, but also highly sustainable. Williams and Heintz is pleased to join Two Sides in getting that message out and in promoting the medium’s responsible production and use. We know the importance of building and maintaining a cleaner environment and aim to contribute in as many ways as possible throughout our map production, map printing, and map folding. Two sides U. S. has an excellent blog, where Phil Riebel, President and COO, Two Sides U.S., Inc. does a great job examining the issues and providing factual, accurate, and science-based information on the sustainability of print and paper. Save the trees, don’t print. I hate seeing this message at the bottom of documents on my computer. It is an easy thing for marketers to say, to make them, and you, feel good about saving time and money with electronic communication. This falsehood carries over in to all forms of print, not just those emails, making everyone believe that paper is bad. Printing is bad. But is it really? Would you say, “Save the tomatoes, don’t eat pizza”? 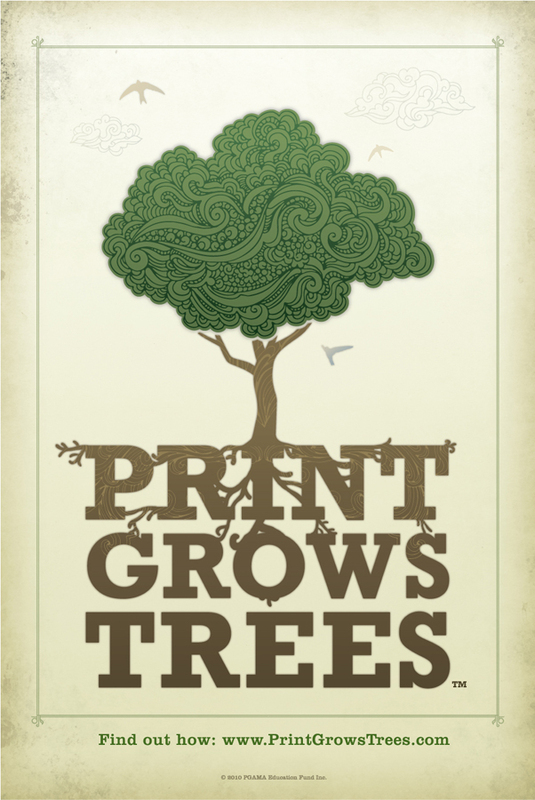 It is a fallacy that electronic media is more environmentally friendly than print. Printed paper is made from a renewable resource. Trees can be replanted in places where they were harvested and also in places where they don’t currently grow. As much as we love our electronic devices, they don’t grow on trees or anywhere else. 54.7 percent of all paper in the U.S. is currently recycled. Printed paper can be recycled, recovered and reused. The systems that are in place for these processes are widely available and have become more efficient and sophisticated over the many years they have existed. In contrast, electronic devices are much more complex and expensive to recycle, recover and reuse due to the toxic nature of many of their components, and current systems are still in the early stages. The average data center serving our electronic devices consumes the same amount of energy as 25,000 households. By contrast, server farms that power computers have become the fastest growing users of fossil fuel in the world, and the amount of energy they use is doubling every year. I, along with printers all around the world, was very surprised to find that Toshiba America Business Solutions has announced that Oct. 23, 2012, will be “National No-Print Day.” Toshiba wants to “raise awareness of the impact printing has on our planet” and of “the role of paper in the workplace. The European organization, Two Sides, has challenged Toshiba’s ‘No Print Day’ as Greenwash . I have a previous Blog post about my experience with printed maps versus electronics. Surprise: Print and electronics work together to provide more value. Why would Toshiba, who makes printers, and fax machines completely loose sight of this? UPDATE: Toshiba has agreed to abort its National No-Print Day!